Hi everyone, and happy Friday! I hope everyone is excited for the long weekend ahead - I know I definitely am! It’s Mai here, and I’m ready for another product review! Okay, so today we’ll be talking about Niu Body and their Awake Rose Toning Mist! I received this product a few months ago, and began using it immediately. 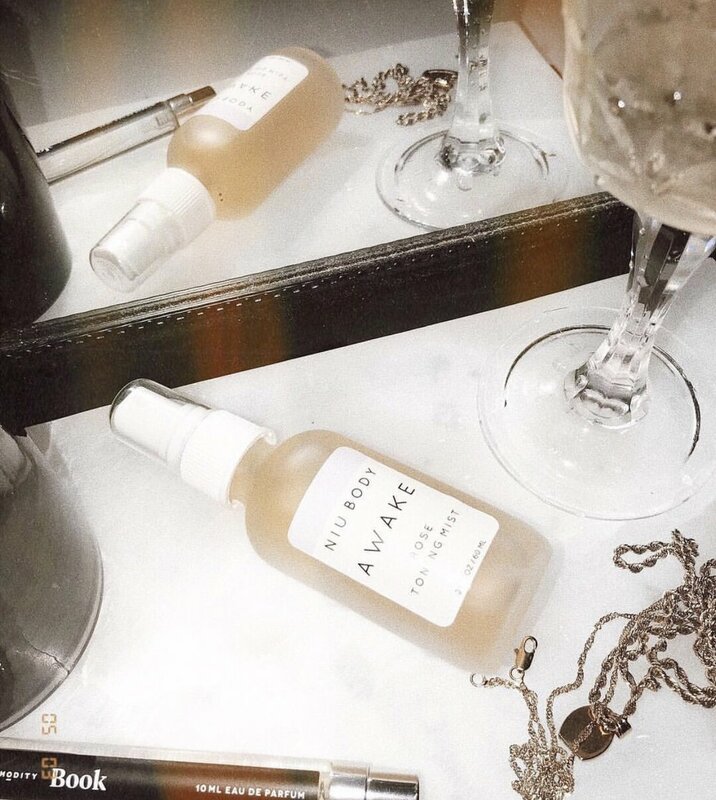 I’m a sucker for face mists, especially ones that are multi-purpose, so I was all over this. Sounds amazing, right? I was so excited to give this a go! “-ROSE FLORAL WATER: Stop and smell the roses, and reduce redness and inflammation while you're at it. -ALOE VERA LEAF JUICE: Aloe has amazing moisturizing benefits, and also contains Salicylic Acid, which combats and prevents blemishes. -WITCH HAZEL: A natural astringent, witch hazel naturally reduces inflammation and prevents signs of aging. -GLYCERIN: Glycerin is a humectant, meaning it attracts moisture onto your skin, keeping it hydrated, soft, and supple. This smells exactly like the famous Mario Badescu Rosewater Facial Spray (love the scent, hate the actual product lol). I’ve mentioned this before, but the MB spray leaves red bumps all over my forehead and cheeks, and I can’t figure out why. I’m in the process of learning more about individual ingredients often used within skincare products + how said ingredients can effect the skin. ANYWAY, after using Niu Body’s spray multiple times, I haven’t encountered any sort of irritation or redness! Yay! I love facial mists and I’m glad my skin seems to love this too. Usage wise, I like using this before + after makeup, in the morning during my skincare routine, and like I mentioned, throughout the day as I feel that I need a refresher. -While I love the benefits of glass packaging, I don’t love how this isn’t very convenient to travel with / carry around with me throughout the day in case I need some sort of refresher. I wish there was a travel option so that I could just throw this in my bag and go! -I’m very picky about how facial mists feel while being applied to the skin. I prefer a fine mist - think Tatcha Dewy Skin Mist or Caudalie Beauty Elixir. Unfortunately, the spray applicator on this bottle makes the application uneven at times, and leaves chunks of water all over my skin. This isn’t that huge of an issue, since I tend to pat sprays into my skin anyway (I don’t know why, I feel that it helps the product to sink into my skin better). I just wanted to mention since I know I’m not the only one that’s picky about how sprays are applied onto the skin. Other than those two things, I really do enjoy the formula of this product! It smells nice, and isn’t irritating at all. I do find that it’s cooling upon application, which I love in the morning. I give this product a 7/10, and I think it’s worth trying out! That’s it for me this week everyone! I hope you all enjoyed this post, and thank you all so much for 5,000 followers! We actually reached the 2 month anniversary of TGA 2 days ago, and I think it’s crazy how fast we’ve grown. We appreciate all of your support! Let us know what you would like to see on the blog moving forward!